Last night I was ‘playing catch-up’ on Facebook and I noticed that one of my high school teachers is having his 75th birthday today! 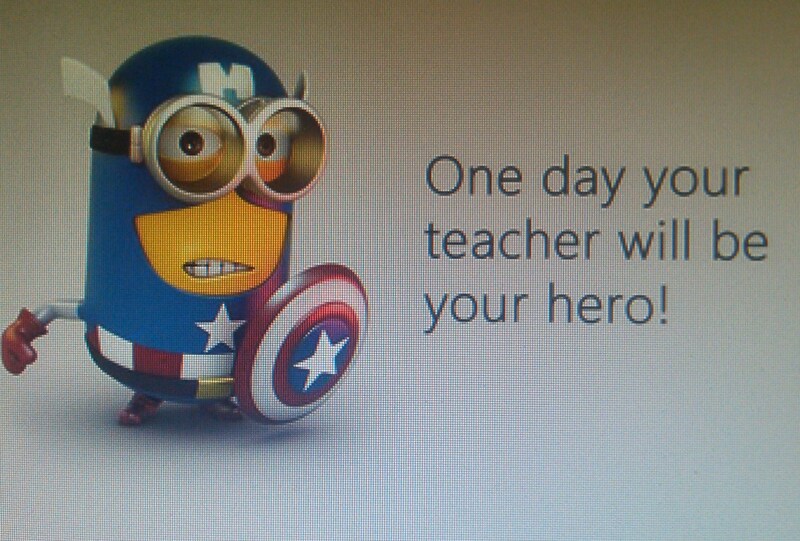 I used this same cutesy little TEACHER HERO image to wish him a Happy Birthday. It may have been a tiny gesture that many of my former classmates might also see, but what they don’t know is the chain-of-reflection that started me thinking about Mr. B last night and how our teachers truly do influence our lives, some positively and others not so much. Mr. B was the best Algebra teacher in the world, as far as I’m concerned! I’d always thought that I was just ‘bad in Math’, as soooo many others also assume. I was a very good student, except for Math. I just couldn’t really understand why I’d need more than the basic addition, subtraction, multiplication, and division. The rest always seemed like a waste of my energy and brain cells; and I was so very eager to LEARN too many other things but there just wasn’t enough time in the school day to fit in all of the classes that I’d hoped to take. So I was annoyed at having to have a Math class, plus I wasn’t grasping the concept of Algebra. The first few days of class were torturous for me….I felt like I was in a foreign language class. I was already taking Latin and this was just too much. Why were there LETTERS mixed in with my numbers? And why were there soooo many ‘story problems’? I tried to slump down into my chair and hoped that the teacher wouldn’t notice me. I couldn’t wait to take my book home and hope that Daddy could help ‘coz he was good with Math. Unlike the way most schools’ curriculum path today, back in the early 70s, we had to take Algebra 1, followed by Geometry, then we could take Algebra 2. I was excited to take Algebra 2 but I couldn’t understand Geometry and did NOT have a very good teacher. I struggled. My younger brother was in my class, and it didn’t help matters that he was an excellent Math student (his only truly good subject) but he was ‘SUPER-JOCK’ and had zero time to assist me, although I had to drive him to and from football and wrestling and baseball practices! So once again, even though he wasn’t even MY teacher, I asked Mr. B for help with my Geometry. That’s what I call dedication! He is truly dedicated to the Art of Education and he is dedicated to his students. Teachers like Mr. B are becoming more and more of a rarity nowadays. Even myself. I couldn’t make it. Of course, I opted out myself. I majored in English/Secondary Education. Daddy really really REALLY wanted me to be a teacher. I have always adored Creative Writing and excelled at all the writing classes that my college offered. My father was ever the practical guy though. He said that “writers are a dime-a-dozen” and that since he was paying for my college expenses, I was adding Education to that degree! (did I mention that I’m a ‘Daddy’s Girl’? hehehe) So I did. After a year of teaching Freshmen English to rich boys at a private Catholic high school, I took myself out of the profession. I felt that I could NOT offer to these students the excellence that I’d been accustomed to so I had NO BUSINESS being a teacher! My heart wasn’t in it. How could I teach these guys when I didn’t even really like them? This isn’t how I was raised; it’d not be fair to them. I had some not-so-good teachers in the past, and I would not want to be remembered that way in my students’ futures when they are reflecting back! I did, however, have 3 excellent students whom I adored and love. That college experience didn’t go to waste after all! God knows what He is doing and my education certainly did NOT go to waste! A couple of decades later I got frustrated with the school system and took my children out of the public schools. I homeschooled them successfully for their last 7 years! What amazing fun we had! I learned a lot right along with them. I actually read everything late at night, made worksheets, and then taught the 3 of them daily as a group in all subjects except for Math (we did that individually). The joy of having 3 kiddies within 4 years shone through in all of our accomplishments. We didn’t have a lot of money for books so we went to library sales and college bookstore sales. So even though the kids were young tweens through teens, many of their Math and Science and History books were college material. If my children would’ve been enrolled in regular (public) schools, they’d have had 5-6 subjects. Mine had 14 annually. We didn’t get up until 9:00- 10:00 each morning, dressed however we wanted without peer pressure, and the best part was that we were able to take our vacations when everybody else DIDN’T! Each of the kids got excellent grades. We went to the theme parks so often that all of them ended up as full-time Disney Castmembers (2 are still there, have been for 10 years), and even though only 2 of my 3 kids have opted to go to college so far….not surprisngly their GPAs are a perfect 4.0! I think and I wish that our country had an abundance of TEACHER HEROES like Mr. B! Imagine how fun it’d be to go to class knowing that we were going to learn something that we’d actually understand! Because of homeschooling my own children, I still have several Algebra books on my bookcases. Often, just for fun….I take out 1 of those books and a notebook and do a few problems because I like to see if I can still do them. I especially get the biggest smile when doing a problem that takes an entire page! Thanks, Mr. B!